Learn about the submit-a-tick program, how to remove a tick, tick surveillance in Alberta, and Lyme disease. Ticks are small spider-like animals (arachnids) that bite to fasten themselves onto the skin and feed on blood. While most ticks do not cause serious health problems, it is important to remove a tick immediately to avoid potential infection or diseases and submit it for testing. The Alberta tick surveillance program helps to assess the Lyme disease risk to Albertans and even their pets. If you find a tick on your pet, yourself, someone else, or anywhere outside, please submit it for testing as part of the Alberta tick surveillance program. 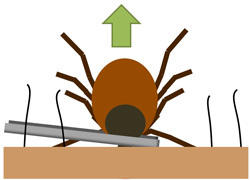 Ticks are checked to see if they are blacklegged ticks. All blacklegged ticks are tested to see if they carry the bacteria, Borrelia burgdorferi, that can cause Lyme disease in humans. This program helps the Alberta government monitor for changes to the risk of Lyme disease in Alberta. Although the risk of Lyme disease is very low in Alberta, there are other tick-borne diseases that can be transmitted by ticks – it is important to properly remove a tick as soon as possible. Using tweezers, gently grasp its head and mouth parts as close to your skin as possible. 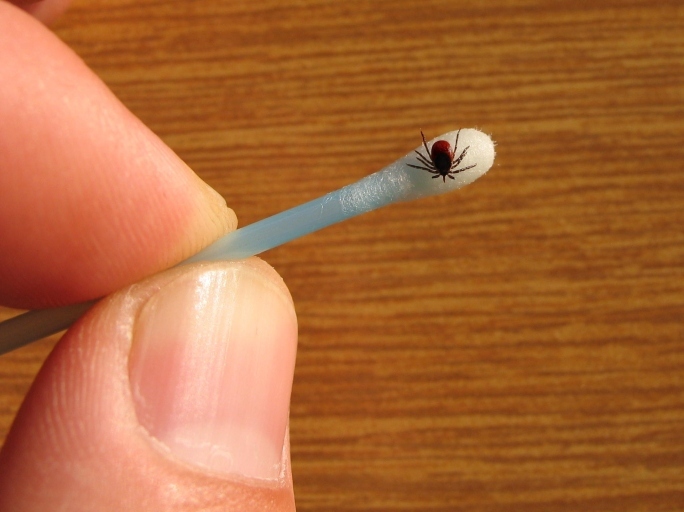 Without squeezing the tick, slowly pull the tick straight up off the skin – do not jerk or twist it. Do not apply matches, cigarettes or petroleum jelly to the tick. Save the tick in a clean, empty container. Do not add any ventilation holes to the container that is being used to put the tick(s) in. You can put more than one tick in the container if they are found on the same person or in the same general area in the environment. Add a small piece of tissue or cotton ball, lightly moistened with water, into the container to prevent the tick(s) from drying out. Submit the tick for testing as soon as possible. Please call first to make an appointment to drop it off. First Nations health centre – If you live in a First Nations community in Alberta, contact the health centre in your community. Veterinarians – If you find a tick on your pet, you can take the tick to most veterinarians. Contact your local veterinary clinic to find out if they will submit ticks for testing. Health care providers – If you find a tick attached to your skin and are concerned about the bite and/or have symptoms, take the tick to the appointment with your health care provider so that it can be submitted for testing. This program does not test for Lyme disease in humans. If you are concerned about a tick bite, see your health care provider. if it was a blacklegged tick, whether the tick is carrying the bacteria (burgdorferi) that can cause Lyme disease. After a tick is submitted to an AHS Environmental Public Health Office or First Nations health centre, you will receive the result from the Environmental Public Health Officer in about a week (maybe longer in peak season). After a tick is submitted to your veterinarian, you will get the result from your veterinarian in about a week (maybe longer in peak season). Walk on cleared trails whenever possible, and avoid walking in tall grassy or wooded areas. Wear light-coloured clothing and cover up as much skin as possible, for example, a hat, long-sleeved shirt, long pants with the legs tucked into socks or boots. Use a bug spray that contains the chemical DEET or Icaridin to repel ticks and reapply as frequently as directed. Check yourself for ticks after leaving a grassy or wooded area where ticks may live. Check your pets for ticks after they have been outside. You cannot get Lyme disease from your pet, but your pet can bring infected ticks inside. These ticks can fall off your pet and attach themselves to you. Lyme disease is the most common tick-borne disease in North America. Lyme disease can affect humans, wildlife, and domestic animals. It can cause an infection and in some cases, if left untreated and able to progress, can cause serious, long-term complications and disability. Lyme disease can be resolved successfully with identification in the early stages of the disease and antibiotic treatment. It is important to note that the risk of getting Lyme disease from a tick bite in Alberta is considered very low. Most ticks found in Alberta do not carry the disease and most tick bites do not cause serious health problems. Learn more about Lyme disease on the MyHealthAlberta website. Lyme disease is diagnosed based on the presence of symptoms, a physical exam, the possibility of exposure to infected ticks and, if necessary, laboratory testing. If your health care provider suspects Lyme disease, you may be asked to provide a blood sample for testing to see if you have certain antibodies in your blood. Public health and laboratory experts in Canada, the United States and worldwide support the two-step testing used in Alberta as the best laboratory method for supporting the diagnosis of Lyme disease. These high standards help protect individuals from misleading false-positive (inaccurate) results and unnecessary treatments. In Alberta, laboratory testing for the first step is done by the Provincial Laboratory for Public Health, which is an accredited laboratory. The second step is done by the National Microbiology Laboratory in Winnipeg, also an accredited laboratory. The Alberta government advises against the use of laboratory testing offered by some private laboratories outside of Canada. Some of these laboratories use in-house (non-standardized) testing methods and therefore may report a higher number of false-positive (inaccurate) results. A study completed in 2014* at one alternate U.S. laboratory incorrectly “found" Lyme disease in up to 57% of healthy people who did not have Lyme disease. *Fallon BA; Pavlicova M; Coffino SW; Brenner C. A comparison of Lyme disease serologic test results from four laboratories in patients with persistent symptoms after antibiotic treatment. Clin Inf Dis; 2014; 59(12):1705-10. False positives can result in misdiagnosis that can lead to a delay in finding the actual cause of an individual’s illness, as well as unnecessary, expensive and sometimes harmful treatments. An increased number of false positives also create an inaccurate and inflated view of the risk of Lyme disease in Alberta. Advising against the use of alternate laboratory testing does not mean refusing to test and treat an individual who is sick. An individual who suspects having Lyme disease should be tested using standardized and approved methods. If found to have Lyme disease, treatment is available in Alberta. Other ticks in Alberta can carry other organisms that may cause diseases in humans such as Rocky Mountain spotted fever (transmitted by Dermacentor andersoni), Powassan virus (transmitted by I. cookei) and Tularemia (transmitted by D. variabilis). The number of cases of these diseases reported to Alberta Health each year varies from 0 to 3 cases, mainly acquired locally. Like Lyme disease, there is a low risk that other tick-borne diseases, such as Anaplasmosis, Babesiosis, Ehrlichiosis or southern tick-associated rash-illness (STARI), may be dispersed into Alberta by migratory birds. Passive tick surveillance (ticks found by the public on companion animals, primarily dogs and cats voluntarily submitted by veterinarians to the program) began in 2007 in Alberta. Since 2013, ticks found on humans or in the environment are being accepted at many AHS Environmental Health offices and health centres on First Nation reserves. Ticks are also removed by clinicians and submitted to laboratories, such as the ProvLab, for speciation and testing. The Alberta government will continue to monitor results from the passive surveillance program to determine if more targeted surveillance is needed. Surveillance will help determine whether blacklegged ticks are becoming established in areas of Alberta, and will enable us to better understand and communicate the risks to Albertans. From 2013 to 2017, there was almost a 3-fold increase in the number of ticks submitted by Albertans. The proportion of blacklegged ticks positive for B. burgdorferi has not increased. Based on the current evidence, blacklegged ticks are not reproducing in Alberta. In Alberta, the risk of being bitten by a blacklegged tick is low. The risk of being bitten by a blacklegged tick infected with B. burgdorferi, the bacteria that can cause Lyme disease in humans, is even lower. Between 1991 and 2017, 100 cases of Lyme disease were reported to the Alberta government. All were reported as having been acquired while travelling outside of the province in areas where the bacteria causing Lyme disease and the ticks that carry it are known to circulate. Health care providers – contact the ProvLab Microbiologist-On-Call to consult regarding the submission of the tick and the correct laboratory requisition form to submit with the tick. Refer to the ProvLab Guide to Services – Ticks.